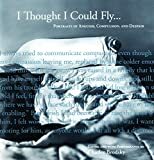 In I Thought I Could Fly... Charlee Brodksy portrays through words and images "anguish, compulsion and despair" as idiosyncrasies of mental illness. The book is a collection of 36 short 1st person confessions, gathered over three years from people who have either dealt themselves, or have significant others who have dealt with psychiatric problems. Each report is accompanied by one black and white photograph. The book's editor and photographer is a professor of photography at Carnegie Mellon University. As she is also the mother of a child with bipolar disorder, she has personal insight into the complex problems with which the mentally ill and the ones near them are confronted in their everyday lives. The introductory essay by Jane McCafferty and George Loewenstein brings forward the keynote of the book, that mental illness, conceptualized as a homogenous whole, is a stigma in the American contemporary society. The mentally ill are held responsible for their condition, which is perceived as dangerous for society. Hence, they should be set aside from the mentally sane majority. In response, the authors raise attention to the negative consequences and the injustice of such social perception. It is a construct deeply rooted in a fear ubiquitous throughout modern history, the fear of the different. The 36 narratives reveal various facets of being mentally different. They are accounts of ordinary human beings about what it is like to live with, or in the proximity of, mental illness. They depict a wide range of psychiatric conditions, from eating disorders and depression, through substance addiction and psychosis, to Alzheimer and schizophrenia. As an epilogue, the book closes with an update on the characters' situation after their reports were collected. Despite an intrinsic desire to communicate and to be understood, most of the mentally ill feel the need to conceal their problems for fear of peer exclusion, social rejection, or financial consequences. The resulting isolation intensifies the psychological pains. Unfulfilled desires of emotional exchange trigger frustration, sadness, or anger; in extreme cases, they lead to suicide. Patrice, a borderline patient with numerous suicide attempts, used to sing repeatedly to herself a song from a Sesame Street record: "different is sad, different is lonely, different is hard for you only" (68). Being oblivious as to how to address a dear family member or a close friend who is mentally ill also induces sadness, frustration and guilt in the ones who are around. Aaron, the close friend of a depressed college student who committed suicide, expresses this when he confesses "I felt I should have been closer to Brian, but I didn't know how" (114). It appears that mental illness, an invisible malady of the soul, is such a delicate issue primarily because of communicational barriers. In Brodsky's book, text and pictures complement each other in a salutary attempt to communicate. The further goal of communication is twofold. On the one hand, it is meant to help people with similar problems feel less isolated, and to motivate them to "speak up" and seek specialized assistance. On the other hand, it should render this terrible experience more intelligible to the majority culture, thus triggering tolerance and compassion. A depressed patient, ironically named Joy, states this goal quite straightforwardly: "I think we just need to face the fact that our minds and our behaviors are just as vulnerable as our bodies" (127). Although not necessarily a pleasant read per se, the book is likely to succeed in attaining both its communicational purposes. The first person vivid accounts of the experience of psychological distress, together with the simple black and white snapshots of reality, are so evocative that they may well create empathy even in the least distressed readers. The authenticity of the reports and down-to-earth simplicity of the pictures do make a significant contribution to taking mental illness seriously. Overall, the book offers an original and realistic view onto mental illness reified. The perspective is neither scientific nor romanticized, but merely human. Consequently, it is accessible and may be of interest to a broad readership. I have a MSc in Cognitive Science and I'm currently a Philosophy PhD student at the CEU, Budapest, Hungary. My focus is on logical models for teleological reasoning under the assumption of rationality throughout conceptual development. I am also interested in the atypical reasoning patterns encountered in mental disorders such as personality disorders, or ASD.